Members, ask for your free mobile SIM at the hostel! 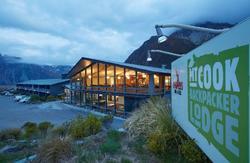 Welcome to YHA Mt Cook ! 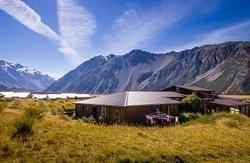 Our beautiful alpine lodge in the Heart of Aoraki / Mt Cook National Park is the perfect base to explore and experience New Zealands Southern Alps. Enjoy the natural beauty of the area by taking walks suitable for all ages and abilities. Kayaking, Skiing, Boating, Flying and Stargazing are all activities that can be enjoyed here in Aoraki / Mt Cook, as well as comfortable dining in the village's cafe's and restaurants. Our backpackers activity boards will help you to decide what to do while you are here. Or alternatively, cook for yourselves and your travel companions in our fully equipped kitchen / BBQ area. Finally to bed, all linen is included in the price, so no need to bring sleeping bags. Buses & Shuttles :- All buses drop off and pick up from the hostel. Own Transport :- Pick up Highway 80, near Twizel ... drive towards the mountains ..
As you enter the village turn left, turn left again at the next junction and the hostel is on your right ..